Officially, Phuket Town was upgraded to "Phuket City" a few years ago, but that was just a bureaucratic way of getting more money from central government. Phuket Town is not a city to me and everybody says Phuket Town. I mean, sure it's a big town and has got more developed and urbanised, especially in the outskirts. Since 1999 when I first arrived in Phuket, there's been a lot of building, lots of housing projects, lots of new roads and shopping centers, lots of money being spent. I remember the first time I drove from Patong Beach to the Tesco Lotus store on the edge of town. A ride through the jungle on a narrow 2 lane road. There was no Central mall, no Jungceylon mall, no Big C, no Index, no Makro, no HomeWorks, no 4 lane roads. The development has come thick and fast. I am not going to argue about whether this is good or bad, whether money is destroying values and culture. I think that the people of Phuket, including myself, are very happy to have all that! Most of the new development is around the edges of Phuket Town. As you head towards the center, the old world is more obvious. I have always liked exploring the town. Every street has something of interest. People may wonder where Thailand can be found in Phuket... if you're staying in Patong Beach, I can understand the feeling. Phuket Town is where a part of the real Phuket can be found. I could walk around these streets taking photos every day. It's what this blog is about - finding real life among the tourists and beaches. 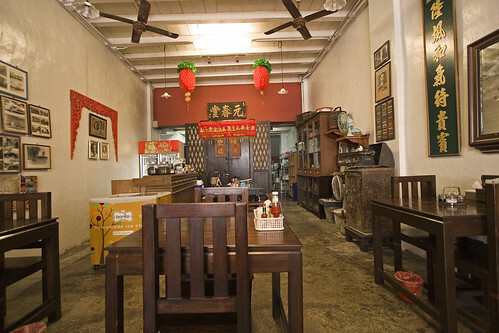 The heart of Old Phuket Town is Thalang Road, in particular the block between Thepkassatri road and Yaowarat road. Pick up any Phuket map and they all feature a map of town, even if only a small percentage of tourists ever visit. What, no beaches? The old town covers a few blocks in the center of town, kind of everything from the main market to the main bus terminal. Yeh, there are some new buildings in there too, but the old early 20th century shophouse architecture predominates. 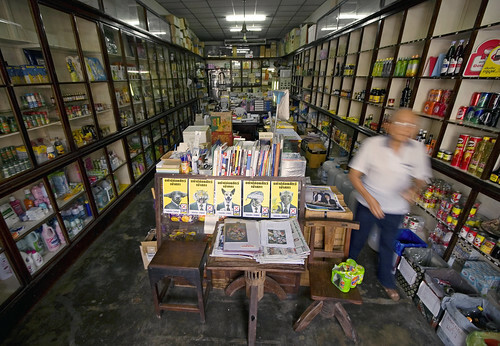 The shop in the photo above is on Thalang road, the shelves are surely decades old. 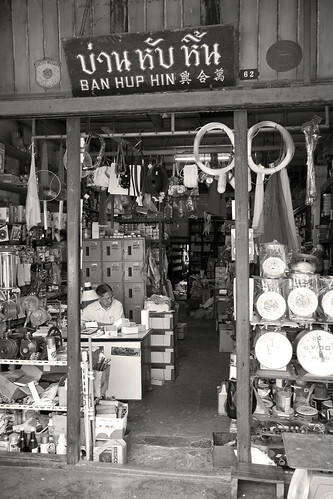 The shop has been there for about 100 years. 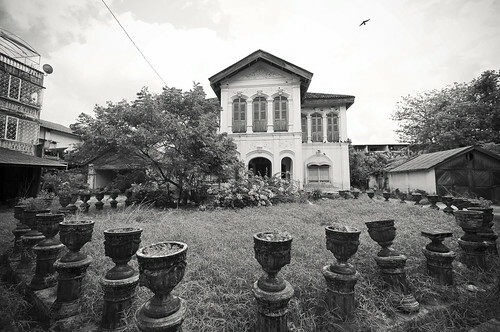 A large amount of Phuket Town was built around that time when the tin mining industry was booming. Thalang Road (above) is where we headed last Saturday. 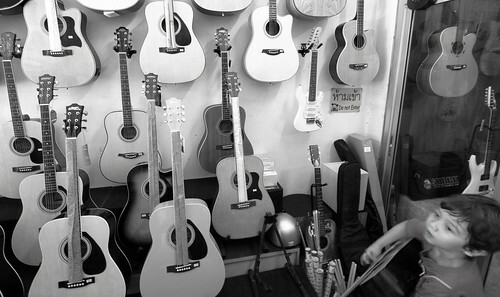 The main reason for the walk was to visit a guitar shop. Our daughter is starting some guitar lessons, and our son thinks himself a rock star.. and I used to play a bit myself. Parking a car in the old town can be tricky. We parked at the east end of Thalang road. The guitar shop is just off Thalang Road at the other end, maybe a 400 meter walk, but filled with a wide variety of shops, restaurants and houses. 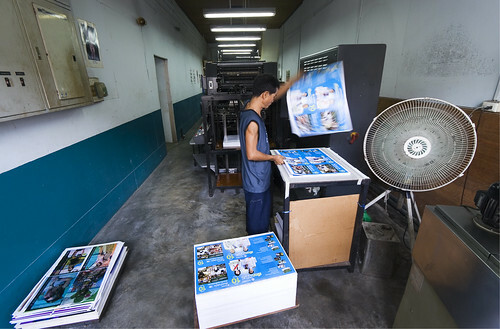 A printer (currently printing election brochures) and a hardware store on Thalang Road. The old businesses like this have been here since the year "dot". They are all run by old Phuket families. Thalang Road still has this feeling of being in the past. But the past crumbles. The street and other streets nearby look better than they did 10 years ago. There is a very active "old town association". Thalang Road has hidden it's overhead wires, so has Soi Romanee, a side street off Thalang Road. And there are signs up in town announcing that cables on neighbouring streets will also be buried. The old town is having a revival. 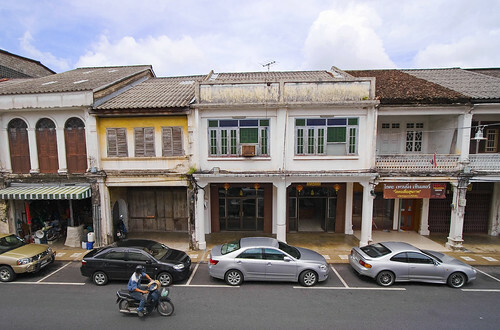 Much of the old town, especially Thalang Road still has the old shophouses. A shop at the front, the house in the middle, out of sight. People used to live where they worked. Shop. House. 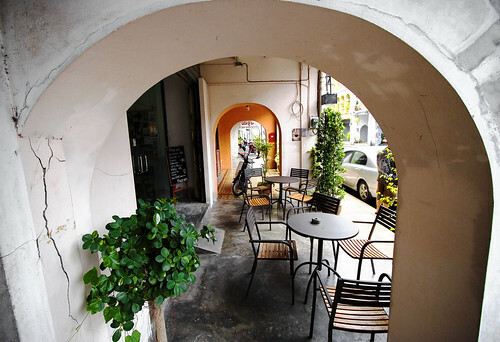 The street outside featured a covered walkway between all the shophouses, with arches between each one. Many of the arches had been blocked off, but the old town association has encouraged people to open up the street again. Now you can walk most of the way along Thalang Road in the shade, or out of the rain. Underneath the arches. So it's an all-weather street! So we found the guitar shop, bought a guitar, and headed back. Thalang Road now has a small tourist information center. 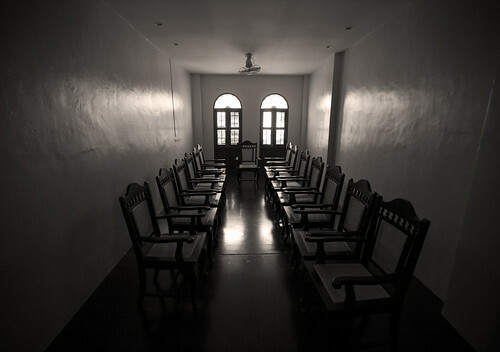 Downstairs you have brochures and displays about Phuket's history and things to see in Phuket Town. Upstairs did not seem to be anything, but my wife had a look and called me up. Looks like a photo opportunity. I need to go there again. Always something new to find. Development is happening on Thalang Road too, but it's low key. New cafes, fresh paint on a crumbly exterior, and regular street fairs and festivals. 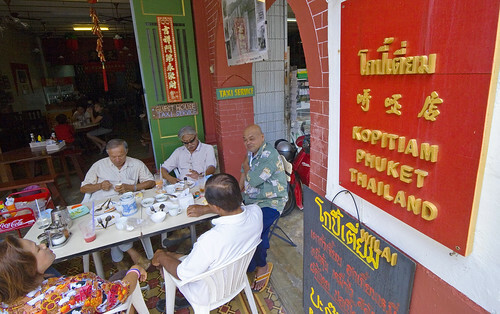 If you want a bit of history, culture and local life.... Old Phuket Town is where it's at! After a bit of a walk, we found it was lunch time. We have a few favourite places to eat in town, but decided to try something new. A restaurant called Kopitiam, on Thalang Road, right next door to the amazing scents of the "Oldest Herb Shop in Phuket". There is another restaurant called Wilai on the other side of the herb shop. The Wilai restaurant has a secret passage through the kitchen that leads to the Shrine of the Serene Light. Another hidden treasure, although the main entrance to that shrine on Phang Nga Road is being widened.... Anyway, Kopitiam - nice place, and I was glad to see a table full of locals sitting there already - a sure sign of good food! Inside there are lots of old Phuket photos, decorations made from "old things", a very tasteful restaurant. All Thai dishes priced at 70 Baht. My chicken with chili and black pepper was very tasty. Kids had chicken with garlic and pepper, also tasty. We'll be back! One more hidden secret before we went home. I had known about this old mansion for some time, had seen photos and heard that it was uninhabited. I found the location using Google Earth. Half a block north of the circle near the market, west side of the road, looked down an alleyway. Found it. Does indeed seem to be abandoned. Except we found 2 rather nasty snarling dogs living there. Not a place to hang around. Phuket is of course best known for beaches, nightlife, diving, golf, family holidays in the sun... It's odd that I live here, but I am not a beach person. I can't sit on the beach. Diving - yes, sure! Nightlife? Small Chang beer please. I have a family, and a job. I am not Thai, not a real local, but Phuket is home. Phuket Town is always interesting to me. And to be honest I am happy that "a walk in the old town" does not interest most tourists! More for the rest of us.